For 23 years, Chris Johnson has been building sophisticated mathematical models to predict where a stock’s price will go next. His research has focused on a single event – the only 100% reliable, predictable market-moving event. An event that moves stocks an average of 733% more than at any other time of the year. An earth-shaking event that creates thousands of “seismic” profit opportunities every year. Now, Chris has cracked a code many thought to be unbreakable – he’s discovered how to trade quarterly earnings with stunning accuracy and even more impressive profitability. Right now, Chris is showing his Seismic Profits Alert readers how he finds the best, most profitable trades out of the thousands price eruptions that occur every year. To be clear, these are extraordinary examples. But Chris’s Stock Market Seismograph can deliver these impressive, market-smashing gains with startling regularity. Results from extensive historical testing of the system showed the average profit across all trades (including the occasional loser) to be an impressive 103%. During earnings season’s busiest weeks, the markets will offer up dozens of possible trades. Some days, there are too many trades to recommend in a trading research service like this. His Stock Market Seismograph identifies only the best of the best, with historical testing also showing an 83% win rate (that’s 8 winners out of 10 trades) and an average profit in the triple digits! For two decades, Chris has used his mathematical wizardry to guide hundreds of millions of dollars in assets under management. But he’s done with big investment firms and high-net-worth clients. Now, he is ready to share his work with you. This legendary expert trader calls himself the “Wall Street Bookie.” Because he knows how to measure the betting action on any stock and use it to pick the short sellers clean. It’s an entirely legal way to make money from the dumbest, most imbecilic traders who consistently lose millions of dollars, day in and day out. A secret you could’ve used to bank more than $81,000 in total cash in your account from all the winning moves he recommended in just 12 weeks. Including every closed and fractional position. Click here to learn more Contact our VIP Services Team for more information and best pricing. Traditional advice from Wall Street investors warns individual investors never to time the markets. It’s too risky, they claim, and you can never really predict what the market is going to do, or when. Instead, they say, you should be content with a balanced portfolio and very modest gains. 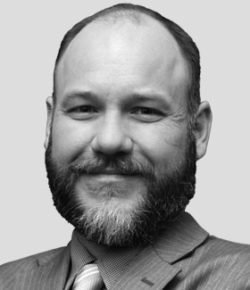 But Quant Strategist Chris Johnson has turned that traditional wisdom on its head. Chris has spent the past two decades developing an incredibly fine-tuned system for predicting the biggest stock breakthroughs every year, down to the exact minute. These price eruptions happen within a 7-day period, and they’re 733% bigger than any “normal” move a stock might make. That translates to massive, predictable gains, as often as 52 times a year. Chris crunched the numbers and showed us the math he uses to predict each one of these price eruptions two days in advance. Every day, his system collects over 750,000 data points on individual stocks and searches all the biggest, safest stocks on the S&P 500 for potential price eruptions. And it’s incredibly accurate. In fact, going back and applying Chris’s system to over 6,000 price eruptions, it racked up an incredible 83% win rate. That means the very real opportunity to post exceptional gains of 231%… of 439%… even 954%…with annualized gains of over one million percent. Frankly, we were blown away. Chris’s breakthrough solves all the “traditional” problems with market timing. Chris’s system tracks price eruptions the way a sophisticated seismograph can track the slightest tremor 500 miles away. And then it magnifies them to create huge profits…231%…439%…up to 954%. Here’s a recent example. Take a look at this “stock seismograph” for NVIDIA, the semiconductor company. The big spike on November 10 is the most recent price eruption on NVIDIA. Two days before the eruption, on November 8th, Chris’s seismograph extracted this triple-digit opportunity from a mass of data, giving investors plenty of time to get in before the eruption. 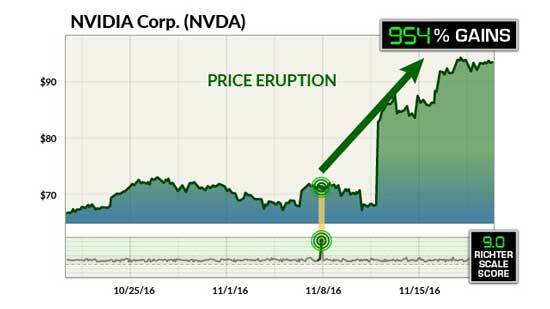 Sure enough, NVIDIA experienced a massive price eruption on November 10th, jumping 33%. And by following Chris’s seismic profit system, you could have turned that eruption into 954% gains in only 7 trading days. Of course, Chris’s system isn’t some occult secret. You may have heard Chris predicting these same price eruptions on CNBC, Fox Business News, or Bloomberg News…read about his research in The Wall Street Journal or Barrons…or even profited from one of his many recommendations over the years. But up till now, only private clients who paid high commissions to a boutique investment firm have had access to the data from his system, and the quant reasoning behind it. For the first time, that’s changing. He calls himself a Bookie. That’s because he’s able to take the dumbest, stupidest, most imbecilic bets that traders make every single day… and turn them into an outrageous amount of money for himself. Now, for the first time ever, he’s revealing how he takes these folks to the cleaners. How much money can be made from this… and exactly how he’s been doing it for years. His little secret has just racked up 1,913% in total winning gains in just 12 weeks, including every closed and fractional position. We’ve gone through considerable effort to get this all on tape. And it’s all perfectly legit. At the very least, you’ll be talking about this for weeks. Paid subscribers have 24/7 access to all of Chris Johnson’s recommendations. You must be logged in to view Seismic Profits Alert action alert archives. Chris Johnson’s Stock Market Seismograph pinpoints earnings season’s most profitable “price eruptions.” During the busiest weeks, subscribers see potentially profitable recommendations nearly every day. You must be logged in to view Seismic Profits Alert media page. Right now, Chris Johnson is conducting a unique experiment to prove just how easy it is to turn $10,000 into $100,000. Dave has never traded before, but he’s agreed to let Chris coach him through his Seismic Profits Alert experience. Each week, you’ll have a front row seat as Chris shows Dave how to transform his portfolio.